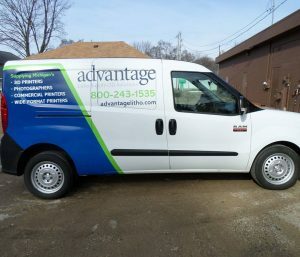 If your business sends contractors, delivery persons, or technicians to client locations to complete work on a regular basis, then a top of the line van wrap that is durable, high-quality, and stylish is what your fleet needs. It adds professionalism to your vehicle, while also serving as protection. SignEdge will help you choose the right vehicle wraps for your business within your budget. Having a strange man approach your home from a windowless van should be a scene in a horror movie and not something your customer should experience. 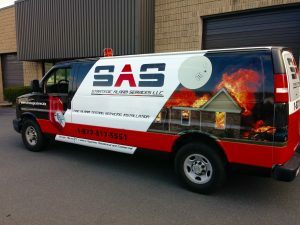 A branded, customized van wrap builds customer confidence that the person at their home or business is, in fact, a representative from your company. The reassurance you give to your customers guarantees a positive customer experience, resulting in better client testimonials, and ultimately more business. Professional fleet vehicle wraps are a fantastic way to up your marketing game and increase the visibility of your business. 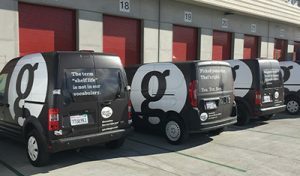 A professionally wrapped fleet vehicle helps to reinforce your branding, as well as serving as an effective marketing tool that travels everywhere with your team. Wrapping your commercial fleet vehicles with branded vinyl car wraps will automatically give you a giant billboard traveling all through town, giving your clients and future customers a constant reminder that your business is open and always ready to assist them. Your business vehicles are not always guaranteed to pass by on pristine roadways. These high-value and costly assets represent a major business investment as well as a means for performing necessary work functions. That is why it is utterly important to make sure that you get the maximum lifespan from your work vehicles. 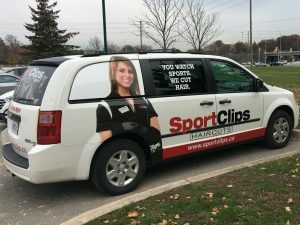 Not only do custom van wraps add trust and professionalism to your business, but they also serve as a layer of protection for your work vehicle. Our sturdy, heavy-weight vinyl wraps protect your factory paint job from dirt, chips, rust, weathering, and dings. In the case of any damage to your wrap, contact us so we can fix it to keep your vehicles looking clean and professional. SignEdge is a full-service van wrap provider, handling all aspects of commercial van wraps from the first consult through installation, maintenance, and repair/removal. During your free consultation, we will talk about your goals and objectives, and provide recommendations regarding design elements and materials. After we have a firm understanding of what you want to accomplish, a draft design will be created to provide a visual representation of your completed, installed wrap. After your approval of the design and triple checking of all the information, your project will then move into the production phase. All the components for your custom wrap will be produced on-site. After its completion, we will set an appointment for installation on-site at our sign shop. You are all set once installation is completed, though we will still be available for any repair needs you may have in the future, if you need the wrap removed/replaced, or need additional graphic elements or to update any business information. If you are considering getting a professional, protective vehicle wrap for your commercial fleet vehicles, we are open to serve you! Call SignEdge today at (705) 999-5332 for a Free Consultation with a Van Wrap Specialist!